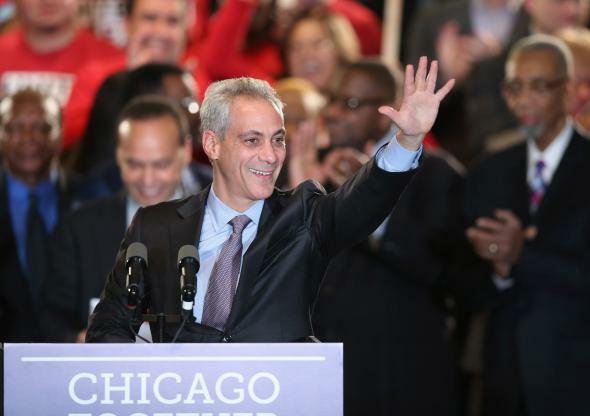 Rahm Emanuel wins Chicago mayor runoff reelection. Mayor Rahm Emanuel greets supporters at an election day rally Feb. 24, 2015 in Chicago, Illinois. Chicago Mayor Rahm Emanuel won re-election on Tuesday night in a runoff election against Jesus “Chuy” Garcia, according to multiple projections and exit polls. Securing a second term in office proved to be far more difficult than imagined, as Emanuel failed to get a majority in the general election, forcing the first-ever mayoral runoff in Chicago. Going into the runoff Election Day, however, Emanuel was able to re-establish his supporter base and led Garcia by 15 points in some polls. Emanuel, politically damaged by his decision to close more than 50 Chicago Public Schools and fighting the perception that he was out of touch with voters and only focused on pleasing well-healed business connections, failed to win 50 percent of the vote in February’s election. That result led to the first ever run-off election in Chicago, with the Chicago Teacher’s Union, angered over the school closings, providing much of the momentum to Garcia, especially in the early days following February’s first round. In the end, Emanuel proved to be too well-funded for the grass-roots campaign of Garcia. Emanuel also effectively attacked Garcia, who had a difficult time explaining details of how he would carry out his agenda, in a series of campaign commercials. Garcia called Emanuel and conceded the race shortly after the polls closed.